Mark Weiser, a chief scientist at world-renowned Xerox PARC, envisioned a third wave of computing, one with “hundreds of wireless computers in every office,” which would come about as the cost of electronics fell. Indeed, from his perspective in the late 80s and early 90s, this prediction made imminent sense. Technologists had seen a dramatic shift in computing: from the many-people-to-one-computer environment of mainframes to the one-to-one relationship of the personal computer era. Drawing this trend out, Weiser foresaw the emergence of a world where one person would interact seamlessly with many computers - a development that he believed would lead to the age of ubiquitous computing. Two decades later, some in the Ubiquitous Computing community point to the pervasiveness of microprocessors as a realization of this dream. Without a doubt, many of the objects we interact with on a daily basis are digitally augmented – they contain microchips, buttons and even screens. But is this the one-to-many relationship of people–to-computers that Weiser envisioned? 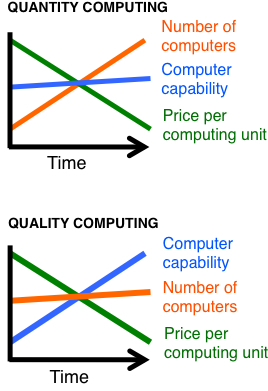 Harrison, C., Wiese, J., and Dey, A. K. “Achieving Ubiquity: The New Third Wave.” IEEE Multimedia, July-September 2010, 17(3). IEEE, Washington, D.C. 8-12.